And don’t forget to review the Core content. 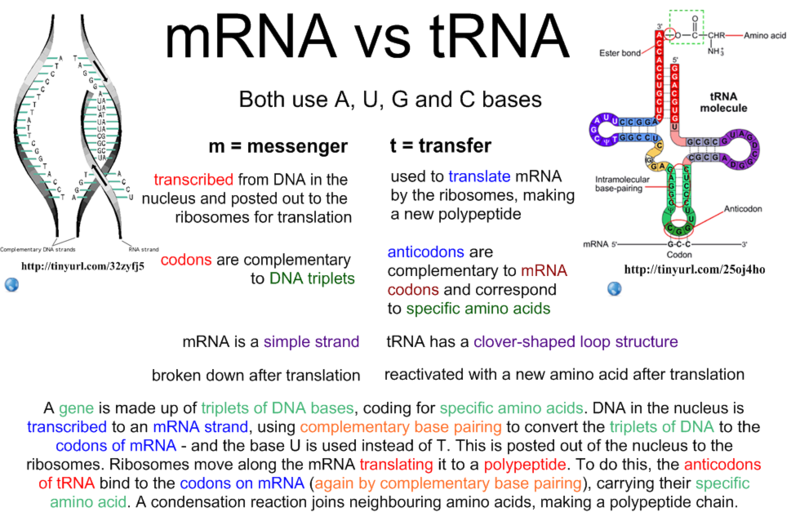 Key terms: transcription, free RNA nucleotide, 5′, 3′, sense, antisense, uracil, U, thymine, T, DNA, mRNA, promoter region, RNA polymerase, nucleoside triphosphates, terminator, introns, exons, translation, tRNA, tRNA-activating enzyme, amino acid, specific, ATP, CCA, ribosome, subunits, protein, binding sites, initiation, elongation, translocation, termination, polysomes, start, stop, codons, anticodons, complementary, peptide bond. Like to say that your website is a wonderful source for teachers and I thank you. I was wondering if the link to Essential Biology 7.3 Transcription & 7.4 Translation will be functioning anytime soon. I would like to take a look at it. Much appreciate it. Love your website. Thanks Momo – it’s updated and uploaded now. Will the link to Essential Biology HL be back somethime soon? Stephen, thank you so much for this wonderful site. I really appreciate your willingness to share. All of the materials are fabulous. One question about the Essential Biology packet for 7.3 Transcription and 7.4 Translation. In questions 4 and 5 should they say transcription instead of translation? Hi Anne – you’re right! I don’t know how that one slipped through. Will correct right now.